Based in Atlanta, Freedom University is inspired by the legacy of the Southern freedom school tradition. 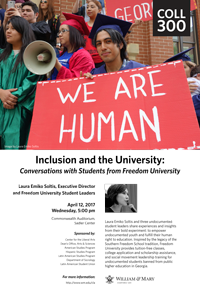 Freedom U. provides a tuition – free education, college application and scholarship assistance, and social movement leadership training to undocumented students banned from public higher education in Georgia. The mission for Freedom University is "to empower undocumented youth and fulfill their human right to education." Freedom U. was founded as a response to Georgia's Board of Regents banning undocumented students from admission to the state's top five public universities in 2010. Emiko Soltis is the Executive Director of Freedom University in Atlanta, Georgia. Ms. Soltis will be engaging students and faculty across campus with several of Freedom U. students.